Home / News / Prize draw winner picks up new watch – and a new house! CG Fry & Son, Morrish Builders and Wainhomes recently held a Help to Buy weekend at Nansledan to give potential buyers the opportunity to find out more about the scheme. 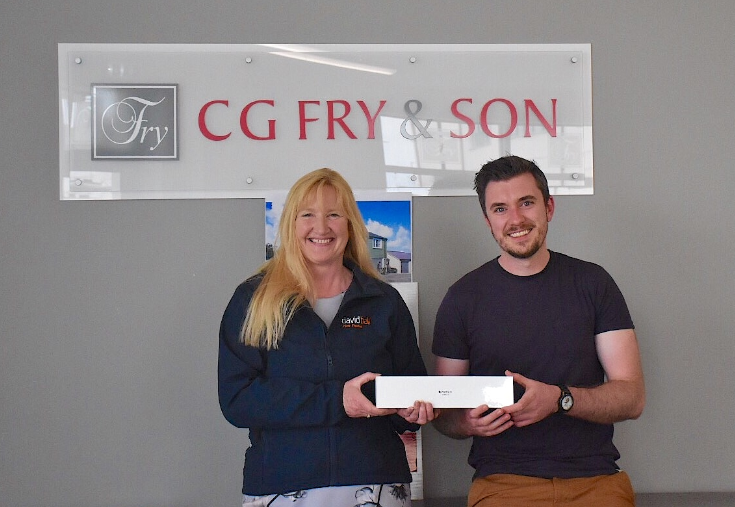 Visitors to the development were entered into a draw to win an Apple Watch Series 3. The winner of the watch, who was picked at random by the CG Fry & Son and Morrish sales team, was Tom Knowles. Tom not only entered the prize draw on his visit, but even bought a house using the Help to Buy scheme. Currently living in Newquay, Tom and his partner Rebecca visited Nansledan after seeing an advertisement in the local papers. They were looking to buy their first home together and were initially planning to opt for shared ownership. However, on visiting the Help to Buy event at Nansledan they realised that using the scheme they would be able to purchase a two-bedroom Coach House with a south-facing garden. Tom and Rebecca have since reserved their new home and are due to collect the keys in July. As Nansledan continues to be a sought-after location in Cornwall, interest in the range of properties that are for sale remains high.